Having grown up on an E.F. Schumacher small-is-beautiful homestead, my heart can’t help but beat with admiration for the grit and self-confidence of the small farmer. Is it possible—we Schumacher types want to know—for these farmers to cultivate a viable business without losing that trademark grittiness and connection to the land? This quest for the secrets of sustainable scaling up led me down winding country roads to the following Maine farmers. While growing their businesses in size and profit, they’re continuing to foster their communities, families, and land. Stewart Smith in his carrot field in Starks, Maine. Asked to name, off the top of his head, the efforts that have made the most difference for Lakeside when creating a viable business, Smith easily offers the following strategies. First, he advocates choosing two or three high-volume crops to pay the bills, and a handful of high-value specialty crops to make a profit. “You can budget a larger tractor with tillage equipment for your high-volume crops, but also use it on the supplemental crops,” he says. This leads to the importance of finding the right equipment at the right price, and taking the time to maintain it. Big-ticket items include the irrigation system and root vegetable harvesters, which he advocates buying used from commercial farmers. Finally, he stresses forming strong relationships with buyers, and making delivery a priority. Leaving the glow of the Lakeside farmhouse, I can feel rather than see the fields spread around me in the darkness, settling into winter slumber as they have for generations. There’s hope that these fields will be productive for many generations to come. As a third-generation Newport farmer, Smith determined while an economics undergrad at Yale that he would work in government, education, and farming over the course of his life. This he did at the USDA under Carter, the Joint Economic Committee of Congress under Clinton, and as a Maine Commissioner of Agriculture. In between, he taught and did research at Tufts and the University of Maine. With wife and partner, Sarah Redfield, he returned to farming and founded Lakeside Family Farm in 2005. It has since become a role model for a successful mid-size sustainable farm that, while not certified organic, follows best practices to minimize the use of chemical inputs. 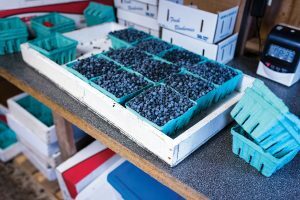 Lakeside now provides 100-some vegetable options to buyers and distributors including Hannaford and Crown of Maine, restaurants such as The Black Birch in Kittery, and the University of Maine. They also deliver workplace CSA farm shares. 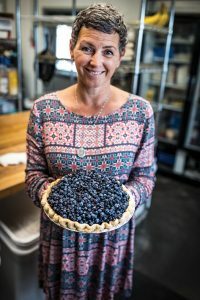 “I’m in charge of the farming and production, and Sarah works with the buyers,” Smith says, with evident gratitude for a partner who is dedicated to the business. Smith works with his crew to repair equipment used for harvesting carrots. 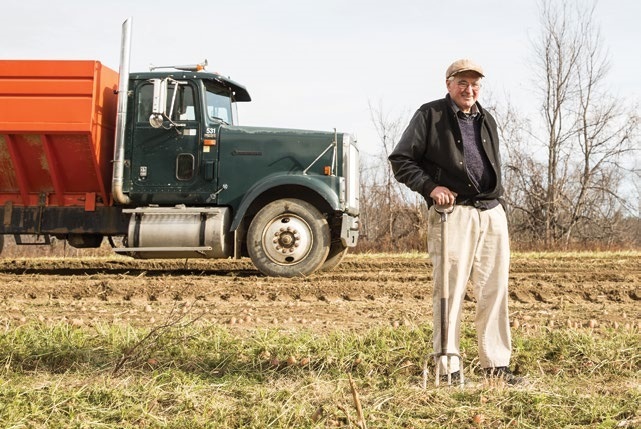 As his midscale family farm grew, it became more productive to rely on equipment. 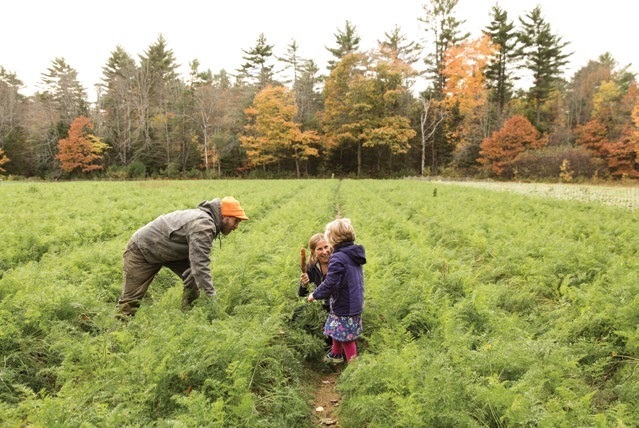 Chris Cavendish, Gallit Sammon, and their daughter Calliope take a moment to pose in their carrot field in Bowdoinham. 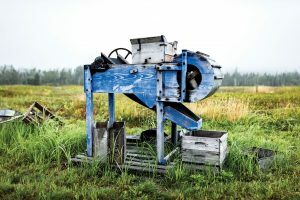 The trip to Fishbowl Farm leads me, with photographer Greta Rybus, 45 minutes north of Portland to the inland estuary of Merrymeeting Bay, its soil rich in organic matter. We track down curly-haired Chris Cavendish at a shared processing facility and are immediately drawn into his bright-eyed enthusiasm for this work. 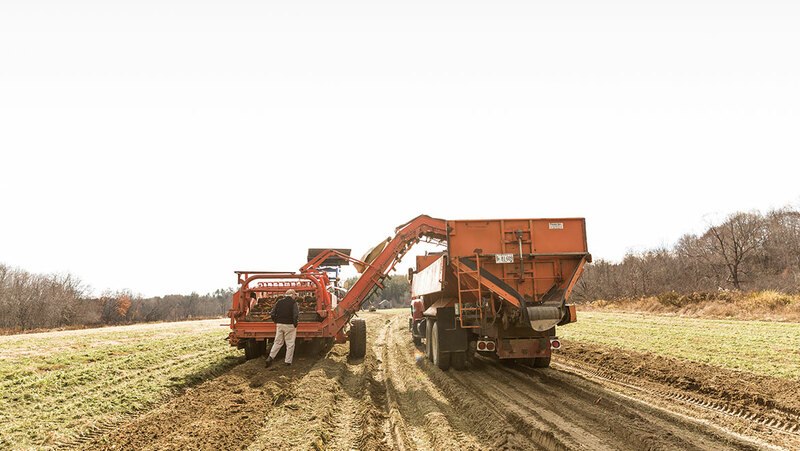 Following him to a 12-acre field that he leases affordably from the Department of Inland Fisheries and Wildlife, we witness rows of carrots miraculously lifted from the ground by the tractor-towed Scott Viner harvester. “I’m anticipating that with the new harvester, we can process 1,500 pounds in an eighth of the time, with two rather than three workers,” Cavendish says, though his data is still speculative. 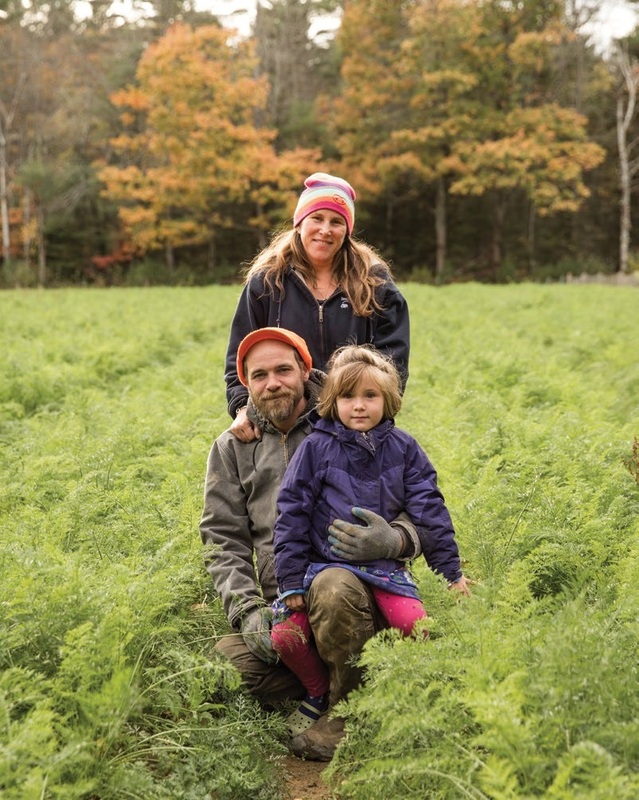 While there are many inspirations and guiding forces that led Cavendish to Fishbowl Farm (meeting his wife and partner, Gallit; MOFGA; Russell Libby), there’s also the 1973 movie that inspired a runner up name, Seventh Wave Farm. As Cavendish tells it, Steve McQueen’s character Papillon, a prisoner on a remote island, notices that every seventh wave in a set is strong enough to carry a man out to sea, and he rides that wave to freedom. 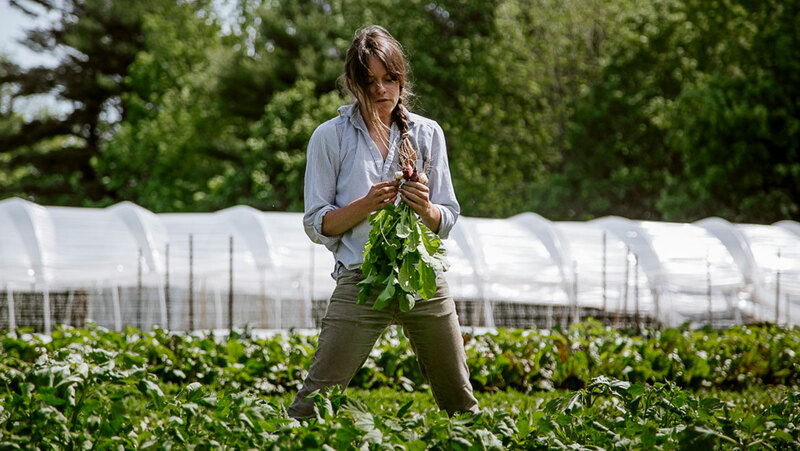 The seventh wave for Cavendish and Gallit (formerly chef de cuisine at the Harraseeket Inn in Freeport), has been the decision to focus on wholesale production of just a few favorite crops. These include greens (spinach, kale, arugula, lettuce mixes) and seasonal vegetables (carrots, tomatoes, peppers, cucumbers, onions). After ten years in business and the birth of their first child, Calliope, Chris and Gallit were feeling the pinch. They didn’t want to sacrifice family life to the 80- to 90-hour-a-week demands of supplying farmers markets and their CSA. 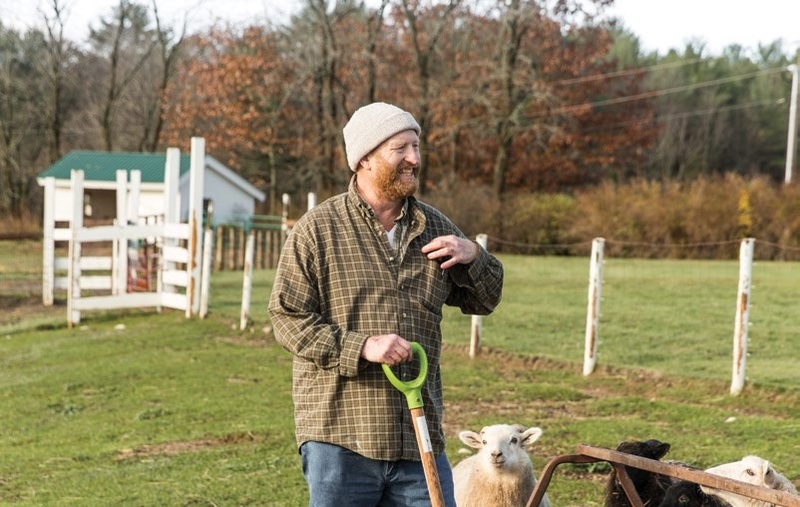 The decision in 2012 to change direction led to a Maine Farmland Trust workshop with Jed Beach of FarmSmart, a Maine-based consulting firm that assists farms with goal-setting, record-keeping, and business planning. The following takeaways have stayed with Cavendish over the past four years. 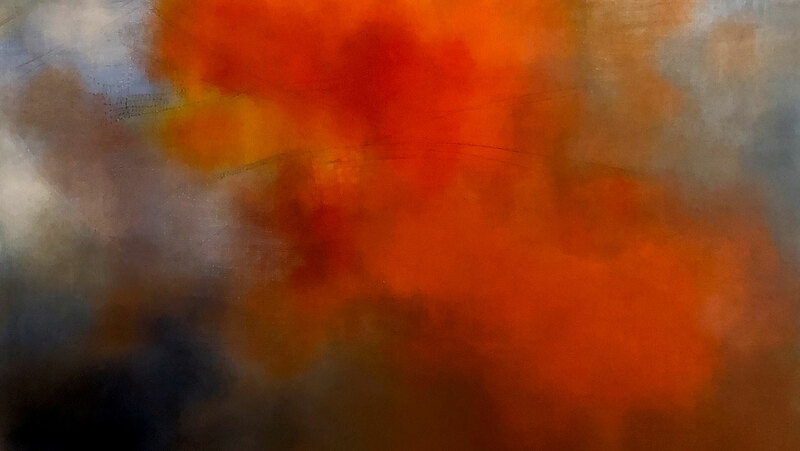 “Chris put this large black number above his desk where he sees it every day,” Beach says. Identify non-farm goals and place them before farm goals. “For me that means ensuring we have a certain degree of normal in our family life during the growing season,” Cavendish states. The results have been commendable, with income tripling from 2013 to 2016. Fishbowl’s recognizable labels can be found on greens and vegetables at Rosemont’s markets and Bow Street Market in Freeport, among others, while bulk orders are sold to Maine Specialty Foods, Flatbread Company, and other Portland restaurants. When Gallit and Calliope arrive to check on the progress of the carrot harvest, the Cavendish family poses for a photo, sitting together in the fields that sustain them. They appear happy and relaxed, comfortable with their lifestyle—a model farm family, riding that seventh wave to farm-family balance. After Cavendish uses a harvester to gently uproot carrots, he and his family get to work collecting and cleaning them. Upon arrival at North Star Sheep Farm, I’m directed to the Welcome Center to meet owners Lisa and Phillip Webster. Well appointed with leather sofas and space for product sampling and hosting events, it sends the message to any visitor or buyer that North Star is a serious operation. “People make the decision whether or not to do business when they first arrive,” Lisa tells me. “The impact of a well-maintained farm is key.” Blonde and of strong stature, she’s dressed in a smart business suit because she goes to Augusta to advocate for farmers as past-president of the Agricultural Council of Maine. The rest of the time, Lisa manages North Star’s sales and marketing, and Phillip, her tall and amiable husband and business partner, oversees the farm operations and employees. 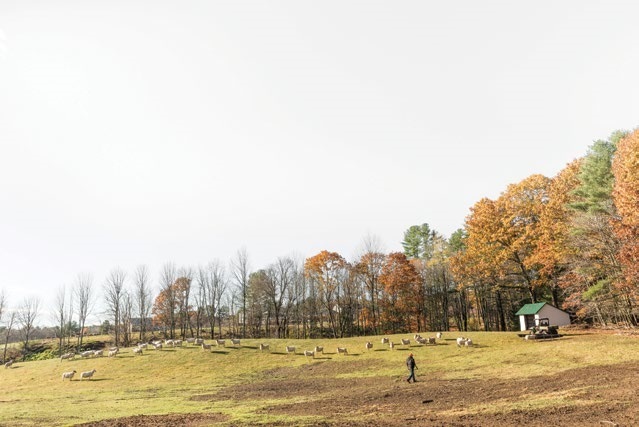 Over 3,000 sheep roam the pastures at North Star Sheep Farm. 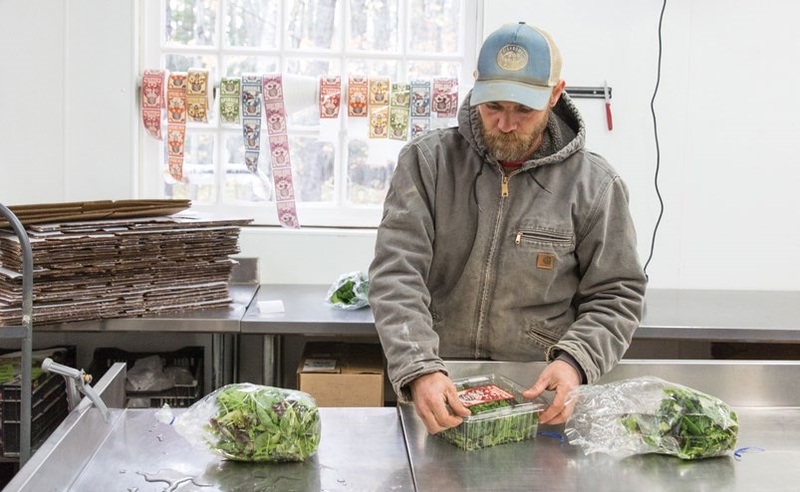 Chris Cavendish packages clean salad greens for distribution around Southern Maine. While North Star has only become a go-to for grass- fed lamb in the past five years, the couple bought their first sheep in 1984. Fifth-generation sheep farmers, both Lisa and Phil’s families have raised breeding stock and meat lambs since the early 1800s. The decision to buy 225-acre Stevens Farm in 1997 brought with it the land for a bigger sheep operation and a $400K mortgage, so they decided to pay the bills with a landscaping business and keep the sheep at a loss. It wasn’t until 2007, after their son graduated from college, that the Websters felt ready to downsize the landscaping business and upsize the sheep farm. 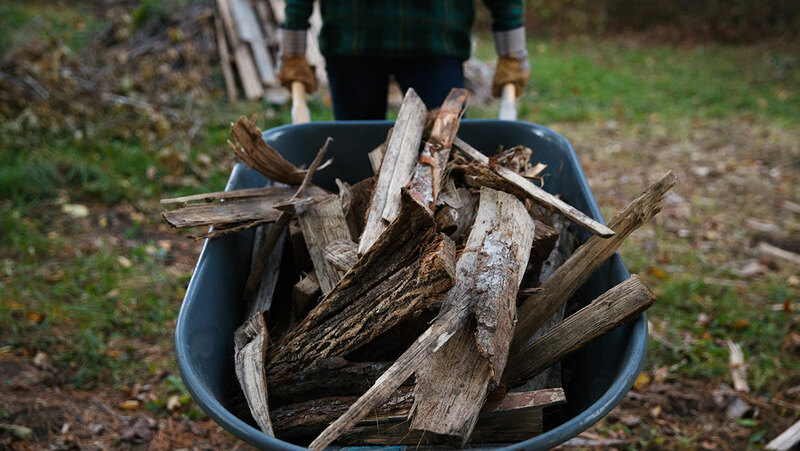 They traveled the country to gather ideas from other farms and wrote a 10-year business plan. They banked on their finding that New England has the largest demand for lamb in the US, due to the high number of white-linen restaurants. So, the Websters reasoned, if you add in New York City and Washington DC, the buyers for 60% of all lamb purchased in the US were within their reach. Phil Webster pauses while feeding his sheep. Despite challenges around establishing viable harvesting, packaging, storage, and transporta- tion systems, in 2010 they secured a deal to sell Whole Foods 12 lambs a week, or more than 1,000 lambs a year, and everything began to fall into place. Foodservice distributor Dole & Bailey and the American Lamb Board began marketing North Star lamb, and they added pork and rabbits. Today their products can be found at Portland restaurants and markets including Fore Street, Back Bay Grill, and Rosemont Market & Bakery, as well as throughout New England and in select DiCicco Family Markets in New York. 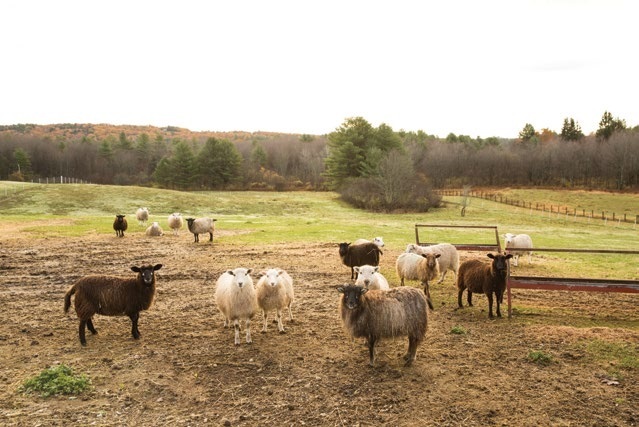 To meet the demand, North Star raises 3,000-plus sheep a year on their farm in Windham, as well as on Collyer Brook Farm in Gray (a property protected by Maine Farmland Trust) and Pineland Farms in New Gloucester. 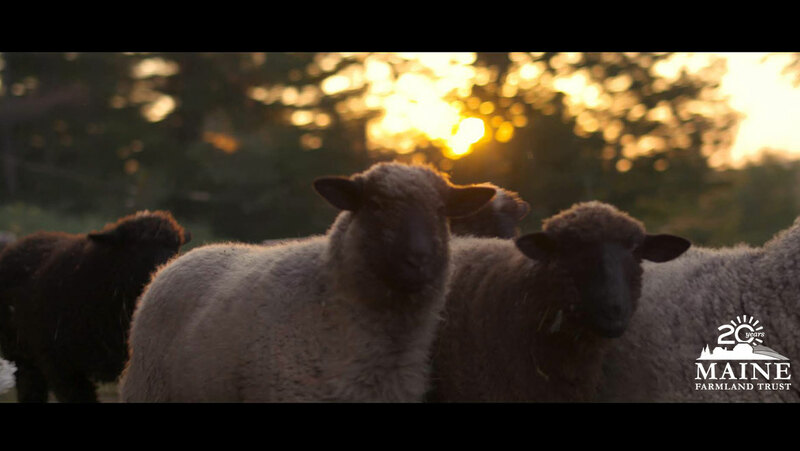 They cross-mate several breeds that do well on pasture-based grazing in the Maine climate, to create an ideal whole-lamb product. Most of all, Phil and Lisa are loyal to the legacy handed down by their family. “We use all the experi- ence of generations past to ensure that today will be successful and tomorrow there will still be a family farm here,” Lisa says. Bonnie Rukin, the funding fairy godmother of Slow Money Maine, reminds me that scaling up isn’t just about the money. 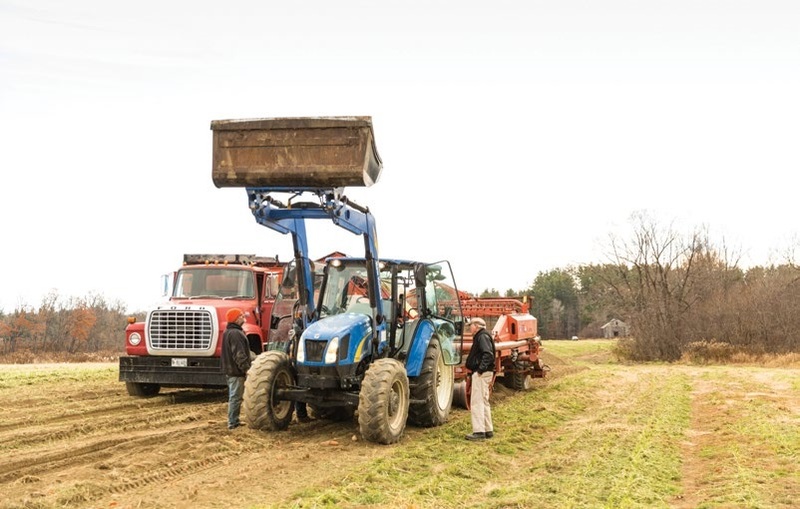 Bonnie has helped numerous small to mid-sized farms, fisheries, and enterprises to focus on larger infrastructure on the path to becoming not just self-sustaining, but sustainable. Fred Kirschenmann, president of the board at the Stone Barns Center for Food and Agriculture and winner of a Lifetime Achievement Award from IFOAM, upholds a similar perspective to Rukin. “We are now faced with transforming into a more ‘regenerative,’ resilient food and farming system that is grounded in community relationships designed in creating shared values,” he told me via email. Kirschenmann is quoting from Michael Porter and Mark Kramer’s article “Creating Shared Value” in the Jan/Feb 2011 issue of the Harvard Business Review. He also recommends John Thackara’s book How to Thrive in the Next Economy: Designing Tomorrow’s World Today. It “describes how the transition from an indus- trial economy to the next ‘bioregional’ economy is not just about farms, but how we all need to work together in our own bioregions,” he says. Businesses and individuals alike are in the process of evolving the understanding of what it means to “do business” in the 21st century. 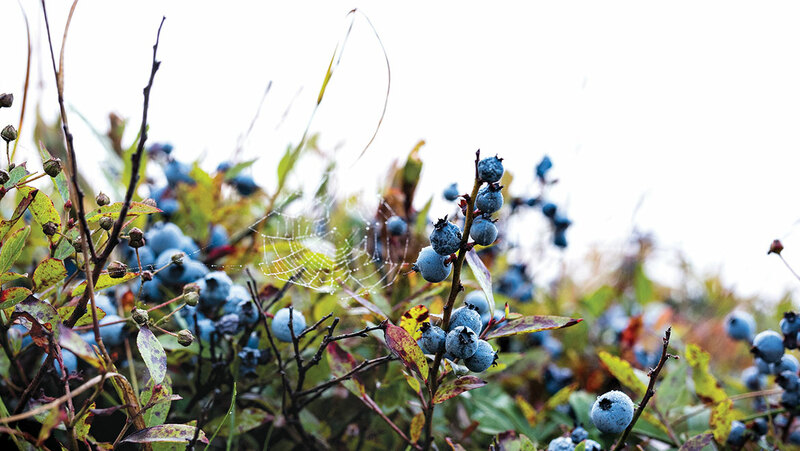 The farms mentioned here have found relative financial reward in their respective paths of growth, but they have also, as Rukin and Kirschenmann emphasize, kept a connection to the communities, families, and acres that sustain them. melissa coleman grew up on a back-to-the-land farm near Blue Hill, Maine. She is the author of a memoir about the experience, This Life is In Your Hands, and writes for publications including The New York Times, Boston Globe, Travel Weekly, and Maine Home + Design. 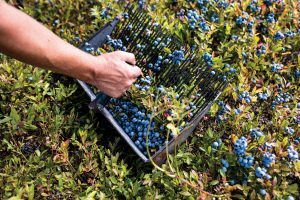 On Tuesday, March 12th, the Maine Legislature’s Committee on Agriculture, Conservation, and Forestry will hold a hearing on LD 920: An Act to Establish the Fund to Support Local Fruits and Vegetables Purchasing. 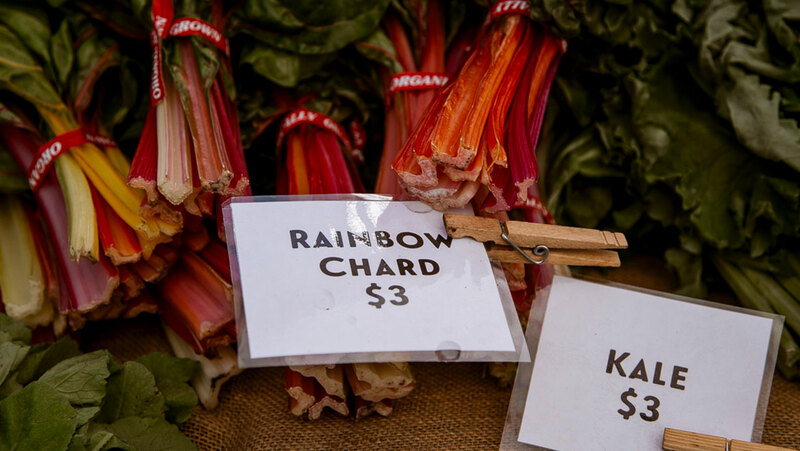 MFT supports this legislation, which is sponsored by Rep. Bill Pluecker (I-Warren), because it would create a fund to provide incentives to recipients of federal food and nutrition assistance programs to buy more locally-grown fresh fruits and vegetables. 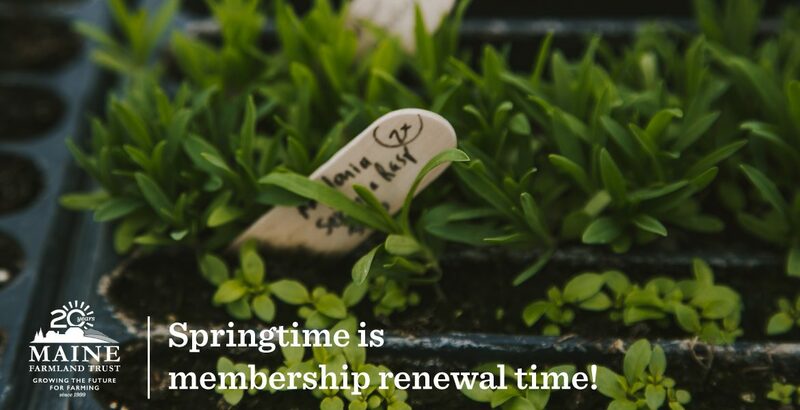 These types of programs, like MFT’s Farm Fresh Rewards program, not only increase access to healthy locally-grown foods for low-income shoppers, but they also help all kinds of Maine farms gain new customers and build sales, thereby keeping more dollars in Maine’s food economy. The hearing will take place at 1pm in Room 214 of the Cross Building. On Tuesday, March 5th the Land Conservation Task Force, a group of diverse individuals and organizations representing agricultural, municipal, sportman’s and conservation interests, released their recommendations for the next generation of land conservation in Maine. Adam Bishop, MFT’s Farmland Protection Manager, participated on the Task Force. 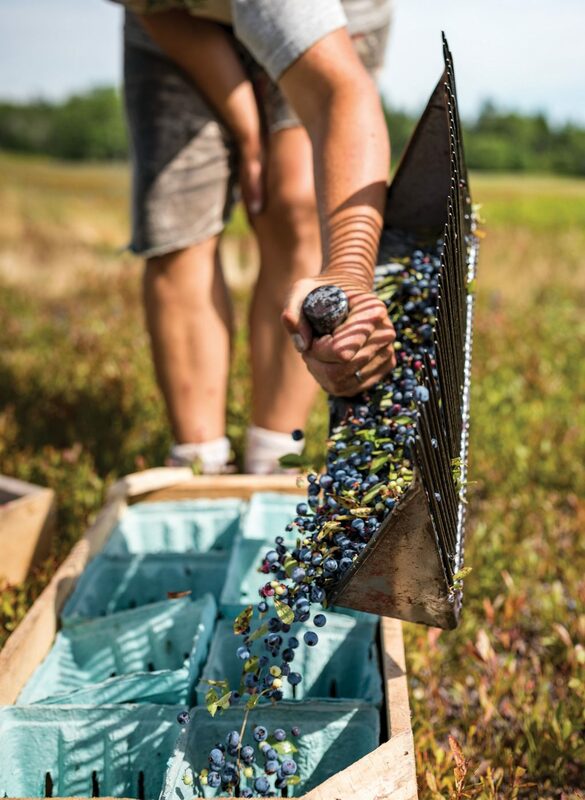 These recommendations included having LMF, Maine’s primary source of funding for conservation in Maine, place a high priority on conserving lands that support Maine’s vibrant farming sector. They also included a request for $75 million in bond funding to support the LMF program and $20 million to support state parks. Please contact your representatives in Augusta and ask them to support LD 911: An Act To Authorize a General Fund Bond Issue To Promote Land Conservation, Working Waterfronts, Water Access and Outdoor Recreation, the bond measure based on the Task Force’s recommendations. You can find your representatives HERE. On Wednesday, March 13th, the Maine Legislature’s Committee on Environment and Natural Resources will hold a hearing on LD 797: An Act to Limit Greenhouse Gas Pollution and Effectively Use Maine’s Natural Resources. MFT supports this legislation, which is sponsored by Rep. Ralph Tucker (D-Brunswick), because in addition to setting long-term and short-term emissions reductions goals, the bill calls for an inclusive process with input from various stakeholders, including the agriculture sector, to update the state’s climate action plan. In creating the updated plan, the legislation also requires that consideration be given to encouraging natural climate solutions like healthy soils practices and farmland protection. The hearing will take place at 10am in Room 216 of the Cross Building.